A cold front slicing through the Plains will help make it feel almost summer-like one day, then much more winter-like the next. 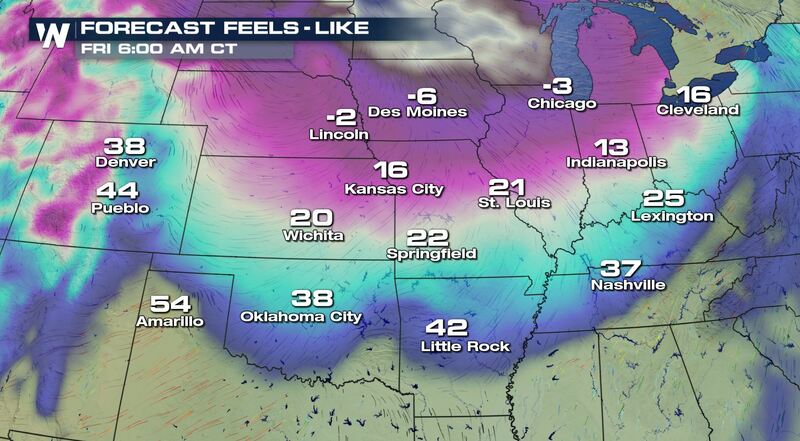 On Valentine’s Day Thursday, February 14 a strong cold front will begin rushing through the northern Plains. Temperatures will be tumbling behind the front but before it arrives, the temperature may feel as close as 75 degrees or warmer in parts of Oklahoma, Kansas and Arkansas! It will feel downright great! 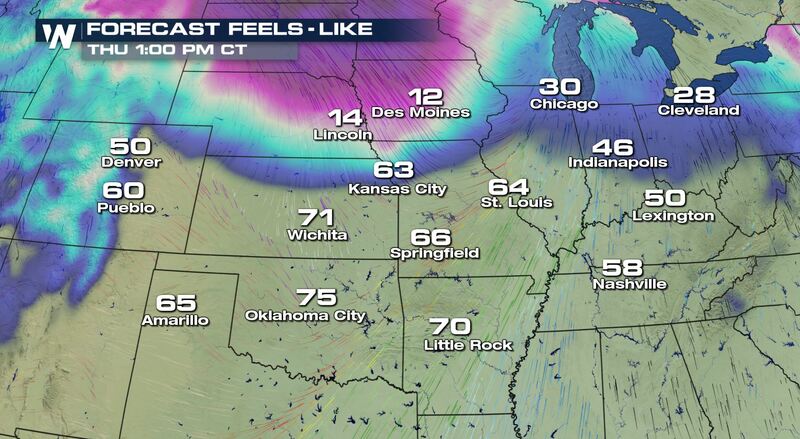 There will be a brisk wind from the south-southwest, so if you plan to spend the day outside…hold onto your hat! Then comes the dose of reality that it is only mid-February. We wake up to a MUCH different picture later that night/Friday morning. 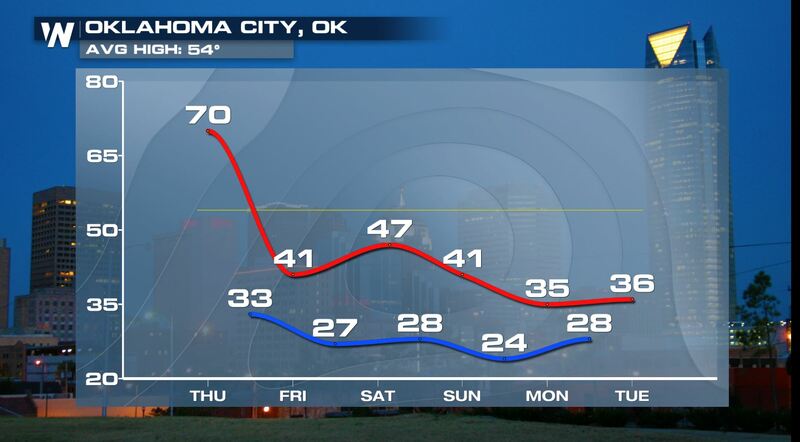 Oklahoma City will go from feeling like 75 degrees on Thursday afternoon to feeling like 38 degrees on Friday morning. Even better than that is Wichita feeling like 71 degrees Thursday afternoon to then feeling like 20 degrees on Friday morning! 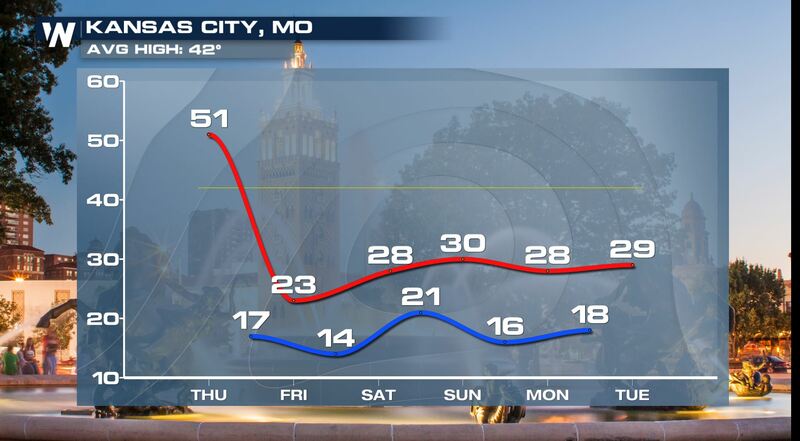 How about Kansas City’s 63 degrees to 16 Thursday to Friday morning? That said, it’ll feel 40 to 50 degrees colder when you head out Friday morning compared to your lunch break on Thursday afternoon. 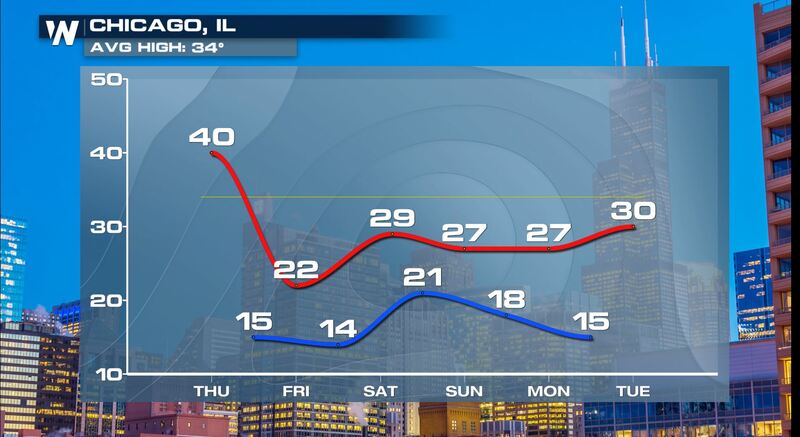 The red line represents the forecast high temperature, the blue line represents the low temperature and the tiny yellow line is the average high. 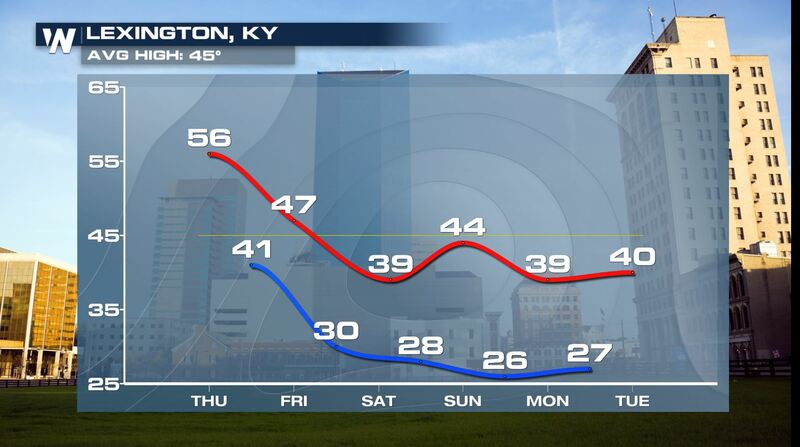 Many locales will go from well-above average temperatures to well-below within a day! The other story within this is that parts of Kansas, Missouri, the Ohio River Valley and even mid-Atlantic will get snow and a wintry mix Friday-Saturday. An area of low pressure will glide along the colder air and drop light snow and ice.